Well, I know it's close to the election given the number of emails I've been getting about stories related to the election. I've said most of what I want to say about the election, because I told myself I was only going to write about stuff that I actually know something about--hence my posts have been on law reviews and a little on race. That's made for a limit on what I've said and also caused me to talk about Senator Obama's time as a law student, a research assistant, and law professor and the implications of his campaign for talk of reparations and what his judicial nominations might be like. I will have something to say about the limited role that race has played in the campaign of late and what that means for the future on the day after the election and perhaps something on the different visions of the two campaigns. I might add that this is a strange and unsettling moment for me, because I've been so much a student (and product) of conservative thought--and so heavily influenced by the age of Reagan--and it's hard to know what exactly is happening. The election will tell us a great deal, though it's always hard to tell whether you're living through a transformative moment. You really need the dust to settle to see just how grand the changes of 1980 and 1984 were; and it's mighty early to start calling this election over, let alone to see in an election that has not happened yet some kind of revolution (socialist or otherwise). 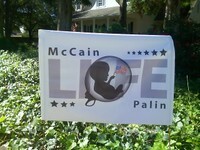 However, in this case I'm responding to an email from a loyal and long-time reader, who sent me a photograph of a McCain -- Palin sign she saw recently on the way to work. It's of a fetus holding an American Flag. I can't find the image on the net. Perhaps the person who lives in the home is the artist. Speaking of flags, I posted some on the right to display American flags--and on a wonderful rendition of our national anthem--over at propertyprof a few years back (and on flags in general).